Prior to the Civil War, Indiana experienced a swell in its African American population due to the migration of free persons of color from other states. The arrival of recently emancipated people and freedom seekers also contributed to the growth in Indiana’s black population. As population increased, so did discrimination against African Americans. The Indiana General Assembly passed laws requiring African Americans to register with county authorities and pay a bond as guarantee of good behavior. They were also prohibited from voting, serving in the state militia, testifying in court cases against white persons, and their children were banned from attending public schools. Certificate of Purchase, image courtesy of the Indiana Archives and Records Administration. 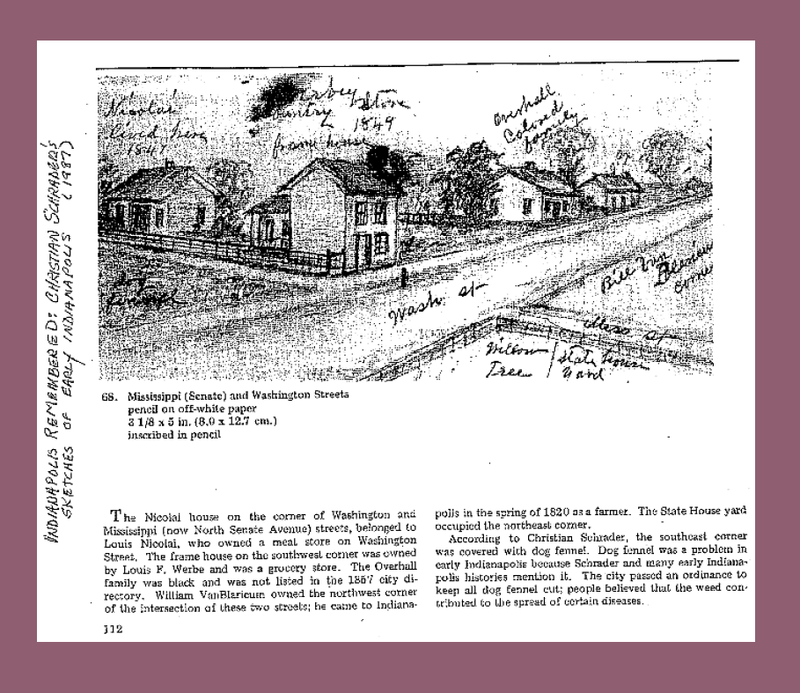 Land ownership offered African Americans the opportunity to circumvent this oppression. James Overall, a free black man, purchased land in Corydon, Indiana as early as 1817 before moving and acquiring land in Indianapolis in 1830. The ownership of land afforded him prominence in his community, as did his work as a trustee for the African Methodist Episcopal church. 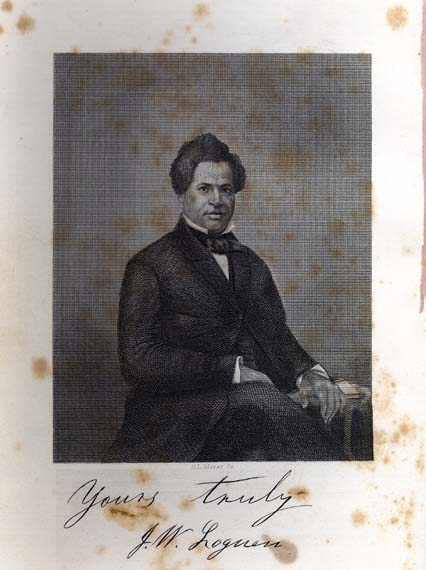 Jermain Wesley Loguen, image courtesy of Documenting the American South. The work on the National road . . . had attracted many men of bad character and habits to this point. These, banded together under a leader of great size and strength, were long known as ‘the chain gang,’ and kept the town in a half subjugated state. Assaults were often committed, citizens threatened and insulted, and petty outrages perpetrated. The events of the night of March 18, 1836 reflected the tense atmosphere. According to Overall, David Leach and other members of a white gang came to Overall’s door carrying arms and fence rails, trying to break into the home and threatening to kill Overall and his family. Overall defended his property and family by shooting the white gang member. White allies came to Overall’s aid and his testimony was corroborated by prominent white Indianapolis citizen Calvin Fletcher. 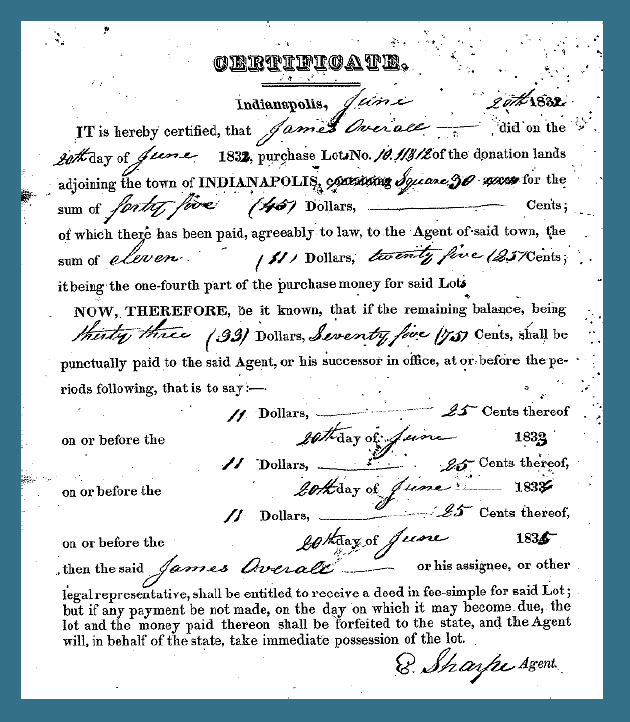 Transcription of Surety of Peace document, courtesy of the Indiana Archives and Records Administration. Despite an 1831 Indiana law that barred black testimony against whites in court, Overall sought legal protection from further attack. His affidavit of the attack put Leach in jail for a short time. He was released on bond, pending a hearing in Marion County Circuit Court. 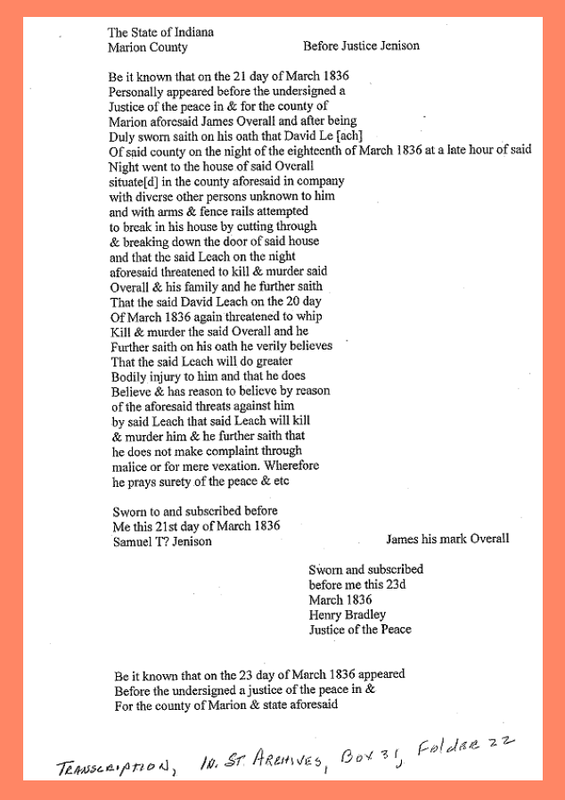 On the first day of the Term, May 2, 1836, Overall declined to proceed with his complaint against Leach. However, public outcry about whether Overall, a black man, could “make an oath against Leach, a white man,” prompted Marion County Circuit Court Judge William W. Wick to write a lengthy statement that was printed May 7, 1836 on the front page of the Indianapolis Journal. The sages who formed our constitution did not leave those rights undefined. On the contrary they have declared them in language so clear as to set at defiance the mystification of sophistry, and all perversions, but the blind misapprehensions of visionary philosophy, stupid bigotry, or mistaken violence. The rights thus secured are, 1st. The defence of life and liberty. 2d. The acquisition, possession and protection of property; and 3d. The pursuit and obtention of happiness and safety. However, Judge Wick’s interpretation of an Indiana law in 1836 did not affect any change in the actual law. African Americans in Indiana continued to be without legal recourse in causes where only black testimony was available against a white party. *Check back with us for information about the September 29, 2016 dedication ceremony of a historical marker commemorating Overall.